The Spanish Blacksad comics are a real visual treat. Artist Juanjo Guarnido is absolutely incredible, in the way that he combines a nostalgic eye for mid-twentieth century architecture with incredibly realistic anthropomorphized people. Each page is a wonder to behold. In this third Blacksad story, our hero finds himself broke in New Orleans, without enough money to get home. He refuses a loan from Weekly, who is flying back to New York, and instead lucks into a job driving a car to Texas for a wealthy man. 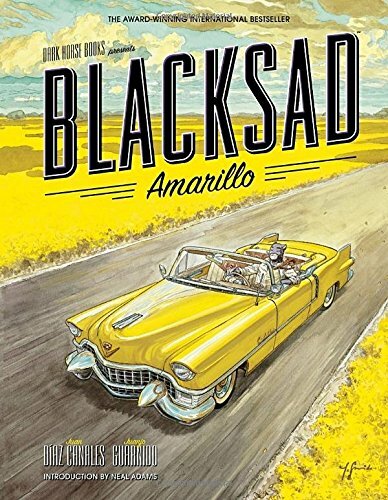 As Blacksad's story begins to unfold, it crosses paths with that of two beatnik writers, stand-ins for Jack Kerouac and Allen Ginsberg, who steal the car, setting John on their path. This story is highly dependent on coincidence, as the FBI agents from the first Blacksad story get in on the chase after Lowell (the Kerouac stand-in) busts up a mailbox, a federal crime. This tale involves a game of William Tell that leads to actual murder (I love seeing William Burroughs portrayed as a genteel flamingo), another murder at a circus, a laughing hyena lawyer, hidden identities, car chases, and a train scene. This is a very entertaining read, which is elevated by the power of its art. I'm not sure if any other Blacksad books have been published in Spain, but if there are more, I hope Dark Horse translates them soon. Odd note: I was surprised to see that legendary comics artist Neal Adams is one of the translators for this book.